Joseph Walters, New Product Design Engineer at transportation window manufacturer Arow Global, was tired of high prototyping costs and long lead times for their products. Walters knew Arow needed a prototyping machine, and upon discovering the Mark Two, realized its ability to fabricate precise, strong, and useful parts was exactly what they were missing from their prototyping stream. The Mark Two has brought parts from $400 down to a few dollars, from two week lead times down to one night, and has changed the way Arow Global designs and fabricates their parts. Markforged paid for itself in less than 14 parts and cut lead time from 2 1/2 weeks to 2 hours. Windows and protective barriers for heavy grade coaches and buses make up the main product line of Arow Global, a Wisconsin based company specializing in transportation window systems. The company strives for design simplicity, robustness, and excellence to keep drivers and passengers safe and secure on the road. Joseph Walters, New Product Design engineer, searches for ways to improve and expand their product line, and with that comes the need to improve Arow Global’s prototyping stream to be a more cost effective process. Walters was confident that some sort of rapid prototyping machine was necessary to improving their prototyping process. “When you do these profiles there’s a lot of guesswork. In terms of rubber, there is no good way currently to prototype rubber extrusions without paying the money to cut the die and get a couple samples in and then do a revision and work from there,” he explained. “With 3D printing, we’re able to do it all overnight…When you’re able to design it, print it, make changes to the design, print it again, make another change, and you’re able to do that very quickly, that’s what drove us to looking at 3D printers”. Because prototyping becomes costly every time you create a new iteration, and because of the nature of the parts Arow needed to make and test, a precise rapid prototyping technology was necessary. In order to prototype properly, Walters was looking for a printer that could handle the wear and tear the end product would have to handle: “We wanted stuff that was useable, so we didn’t want to just basically have a Cube Pro that can do PLA and ABS, which are very brittle. 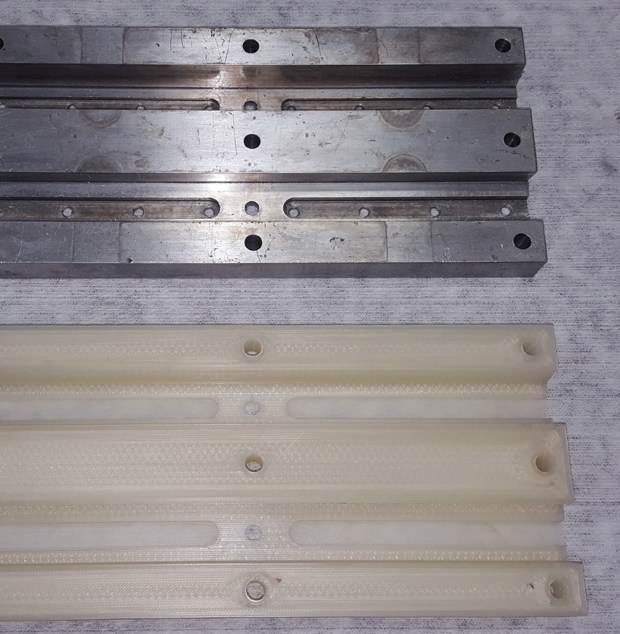 That was one of our requirements and that’s when we found Markforged…the fact that you can inlay carbon fiber to create parts as strong as aluminum, that really sold us on it,” he explained. Once he discovered the Markforged printer through printer reseller Big Systems, Walters needed to convince the higher-ups that the investment would be worth it, which didn’t end up being a problem. “Overall just because of the excitement from the new technology and the fact that it’s paying for itself very very quickly, once we got the paperwork in order, the approval came very fast,” he explained. Because the Mark Two could vastly drop prototyping costs and lead time while it could increase both end product efficiency and production time meant that it could easily improve Arow Global’s design process. Now Walters and Arow Global seek to expand the use of the Markforged printer to lower costs and reduce manufacturing and assembly time: “In terms of drill jigging we’re looking at basically rethinking how we can do drill jigs. Now we can do more complicated machining designs that we simply couldn’t do in the past because you can’t machine like that….with Markforged, because it’s an additive, not subtractive machine, we don’t have to worry about that.” The Mark Two has allowed them to simplify and expand prototyping, and provides the ability to rethink their design and manufacturing capabilities in more ways than one.